-We prefer that any orders be placed by phone, 1-877-387-6511, as so we can better assist our customers ensuring the best fitting kit/system. to use- just spray on, scrub, and rinse clean. your old roof will look like new again. 1.Remove loose coating or caulking and scrub your roof. the 4"wide Ultra-Flex fabric as you go. finish that will withstand the elements. 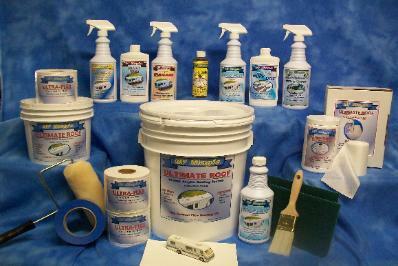 High performance cleaner for rubber, vinyl, and fiberglass that removes all built up roof oxidation. surface, scrub, and rinse clean. Biodegradable. treat a 40' coach. Can also be used on vinyl awnings, plastic mouldings, A/C shrouds, and window trim. Leaves a nice shine too! the color of your vinyl awning. It is also great for removing bugs from the front of your coach. best. Easy to use by hand or power wheel. safe on Gel-Coat finishes, acrylics, metallics and non-porous surfaces. It can be used over decals. Each coat of polish will get progressively shinier and deeper looking. dashboard, window gaskets,even motorcycle seats. Contains mink oil and other all natural ingredients. 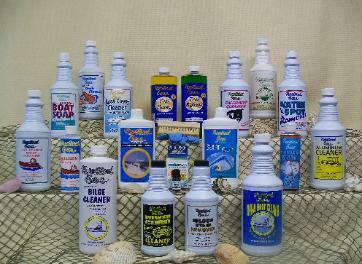 Check out nauticalease.com for our complete Marine Care line. Ultra-Flex, scrub pads, paint brush, DVD & instructions. For use with 2-9 Gal Applications. Does 25' of seams or 10 sq. ft. Does 100' of seams or 40 sq. ft. Does 200' of seams or 80 sq. ft.